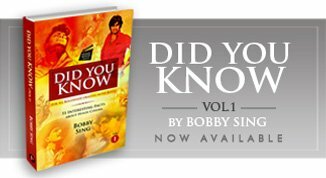 01 Mar, 2018 | Did You Know! 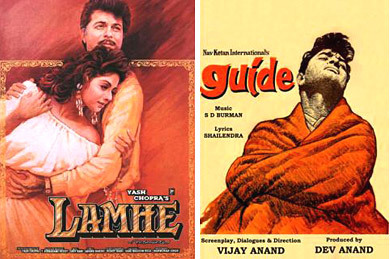 As two path-breaking attempts of Hindi Cinema braving the odds in two entirely different eras at the gap of three decades, both LAMHE (1991) and GUIDE (1965) had unconventional themes based on love and relationships, that didn’t result in any similar outcome at the box office surprising many. Interestingly, where a bold GUIDE was readily accepted by the viewers in the 1960s, there a brave LAMHE got rejected by the same viewers in the much developed and progressive 1990s. Anyway, the two films are now unanimously included in the list of cult classic films of Hindi Cinema and have an interesting link between them too, which was recently conveyed by one of the senior most film journalists, author and columnist Nalin Shah, post the sudden, shocking demise of the incomparable Sridevi. As an intriguing case, both the films had a similar kind of situation in their story progression, where the female lead has a fight with her husband/beloved and then she expresses her aggressive anger and frustration in a long dance sequence shot on an instrumental track. In fact one of the most appreciated sequences of GUIDE is the novel snake dance by Waheeda Rehman on a 3 minutes long musical track composed by S.D. Burman. The same situation happens to be there in LAMHE too when Anil Kapoor slaps Sridevi post her unexpected revelation and she dances her anger out remembering the hard slap. The less than 3 minutes track was also included in the film’s original soundtrack titled ‘Moments of Rage’ whereas the snake-dance track of GUIDE can only be found in the film. Incidentally, the GUIDE sequence was right there in director Yash Chopra’s mind too as his inspiration before shooting the LAMHE dance track and that’s exactly what he conveyed to Sridevi - to repeatedly watch and study it as a perfect reference material before the specific shoot. Simply amazed and highly inspired by the unmatched dance performance by Waheeda Rehman, Sridevi interpreted the situation in her own way and delivered a spellbinding dance performance enacting the ‘Moments of Rage’ emoting on the upbeat track. So now knowing the link, just watch these particular dance sequences once again and see how inspiration results in excellence when it comes to exceptional artists on screen like Sridevi. Moreover, do watch the GUIDE’s dance track especially stressing upon its technical aspects and cherish the brilliance in its remarkable amalgamation of performance (Waheeda Rehman), music (S.D. Burman), choreography (Hiralal), camerawork (Fali Mistry), art (Ram Yedekar), editing (Vijay Anand/Babu Sheikh) and direction (Vijay Anand), together creating an unparalleled, outstanding gem, as one of the key features of the film. Later as Sridevi mentioned the point of reference given by Yash Chopra to Waheeda Rehman (her co-actor in LAMHE), then Waheeda fondly recalled the times when the dance director gave her a real tough time in the vigorous dance rehearsals continuing for days before shooting the ‘cult snake-dance’ sequence. In fact she also revealed in her interviews (years later) that those early morning and late night dance rehearsals were so killing that she even had difficulty in walking for days, as the muscles kept aching and took a long time to recover post the specific shoot. However it was certainly worth all the pain felt, as this particular ‘Snake Dance’ insertion has no other parallel in Hindi Cinema till date and all other dance sequences in films related to snakes remain completely different and unrelated with the GUIDE one. Coming back to LAMHE, it has another amusing link with GUIDE, as it also features “Aaj Phir Jeene Ki Tamanna Hai” in its entertaining parody and we have Waheeda Rehman only dancing to the track giving an adorable, loving tribute to her own classic. There is another small & insignificant coincidence when it comes to Guide & Lamhe. There was also an English version of Lamhe for a channel in England as well as in India. I remember seeing it in 2001. I don't remember the exact name but it was something like Indian Summer. Unlike Guide however, it wasn't a separately shot version, just a dubbed version much like when Deewaar was dubbed & called I'll Die For Mama. Yes Neel, there were many films dubbed in English which was specifically done for the foreign market before the net revolution post 2000. However there are just a few that were simultaneously made in English.